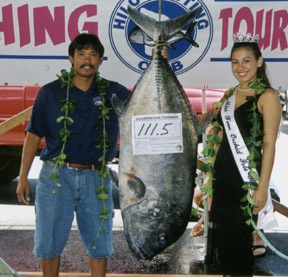 Troy was competing in the 28th Annual Hilo Casting Club Tournament when he hooked and landed his monster ulua. He fought the fish using a Jeff Andrews pole, Newell G454F reel and 80-lb test Maxima line. The 111.5-lb giant trevally captured second place.